Last week I teased your tastebuds by suggesting that maybe P’s linguine agli scampi would be this week’s What’s Cooking Wednesday featured dish. This is a very easy recipe and looks pretty classy when it’s all finished too–as well it should for the price of prawns these days. And probably all days, but I only know about these, so I’m limiting the generalization. 1. As this sauce only takes about a half hour from start to finish, go ahead and put your water on for the linguine before you start doing anything else. Wash and cut tomatoes in half and put aside. 2. Put the olive oil in a pan on medium heat and sauté garlic until just turning light golden brown. 3. Now here it gets a little complicated. Put everything else in the pan. 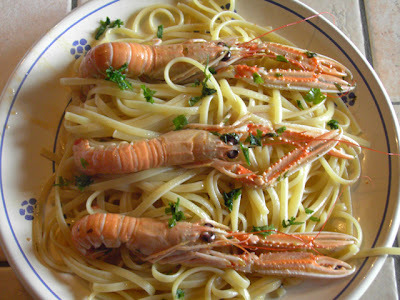 Yes, add the tomatoes, prawns, wine, salt, peperoncino, and most of the parsley (save some to garnish). 4. Cover and let simmer for about 20-30 minutes. As you can see, we cook the prawns as they are, heads and all. If you’d rather shell them first, by all means, snap off their heads, devein if you must (shouldn’t that really be a hyphenated word? ), and get on with it. The recipe is still going to go pretty much the same, but be careful not to overcook the fish (thereby completely losing your prawns in the sauce). 5. So while the sauce is just about ready, drop your linguine in the boiling water and cook till al dente. In the meantime, take the prawns from the pan and put aside. When the linguine is done, add it to the pan (the sauce will be thin) and mix well. 6. Serve each dish with a few prawns and fresh parsley on top. Yummy. I am going to make it right now…..
You know, I just NEVER see whole shrimp in the grocery stores around here in Thriladelphia. I could probably find them at the Italian Market fish shops…hmm…maybe Sunday dinner? Me thinks yes. Now, will the boyfriend be weirded out by being served whole prawns? Time will tell. Christine, now that you mention it, I don’t remember seeing them much in Philly either. Where *do* they put all those heads then? Anyway, I like them whole b/c it sort of, a little bit makes me feel like I’m eating lobster. You know, just…mini. This looks sooooo good. It reminds me though of an experience I had in a Vietnamese restaurant here in Ottawa. Another patron ordered noodles with prawns and was so disgusted when the very large prawn arrived whole (antennae and all) that she sent it back and couldn’t eat anything else. I, on the other hand, also like to pretend that it is an itty-bitty lobster. There’s just something so strange about your food looking back at you… those beady little eyes! I’m sure those heads (and all the goods inside) give the sauce so much more flavor though. I often see prawns with the head on (and actually I prefer to cook them that way because you get more flavor), but I have never seen them with the claws on. But they’re cute that way! They look like little aliens. Little delicious aliens. I’ll just have to take your word on how delicious this dish is. Michael has a fatal shellfish allergy. I craved shrimp like crazy when I was pregnant with the girls and couldn’t eat it. I have a package of them in the freezer. That’s pretty much how I can get them if I don’t drive to the sea. I am seriously jealous oif those views in the later post, so I am guessing you get these fresh? This recipe breaks the “less than 10 mins or more than 2 hours” rule we were all taught about tomatoes… so it works, eh? But, no, shellfish allergies and prawns should never mix. Shan, I’m so sorry you had to do without shrimp, especially while craving them. Sad, sad. Laurie, I’m so happy it turned out so well! More recipes weekly! Judith, although we get a lot of seafood fresh, I got these little guys frozen the morning before–on sale for just 5 euro for about 20 of them! One of the best things about living here, though, is that even their frozen food is pretty good. It’s quite amazing, isn’t it? i love them ; both swimming and eating, but dont know how to tackle them when im in a restaurant and i always avoid ordering this dish, so tasty anyway i buy the fish without the heads and frilly bits on, guess im missing out then!